After upsetting longtime Democratic incumbent Napoleon Stringer in the Lee County School Board District 7 race during last Tuesday’s elections, Republican Brian Roberson said he now has his sights set on how he can make a difference for those in his community who elected him. “I am excited to get to work and am ready to learn all that is expected of me in this new role,” Roberson said. Roberson defeated Stringer by a 1,500 – 1,069 vote margin during last Tuesday’s midterm elections, inheriting a district that includes West Smiths Station and Wacoochee Elementary schools and covers portions of the city of Smiths Station. 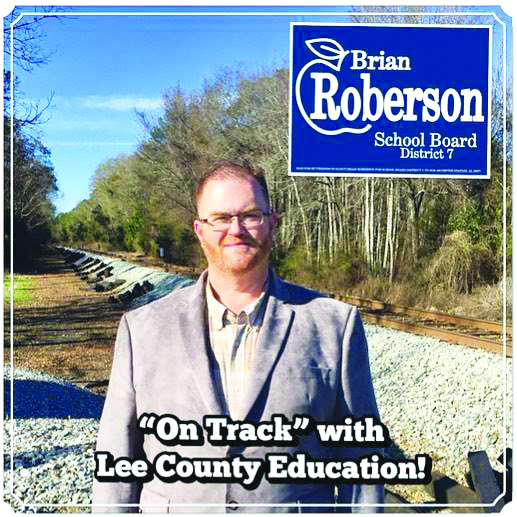 While on the campaign trail in District 7, Roberson said he noticed a plethora of issues to address if elected, ranging from improving the functionality of Smiths Station High School’s Panther Stadium to increased student safety with the hiring and placing of school resource officers at schools in his district and around Lee County. In office, Roberson said his 15-plus years of leadership experience will help him be an easily accessible and approachable board member for constituents who have concerns or issues they desire to be addressed. Roberson will be sworn into office at the Lee County School Board’s Dec. 10 meeting. For more information, visit www.lee.k12.al.us.